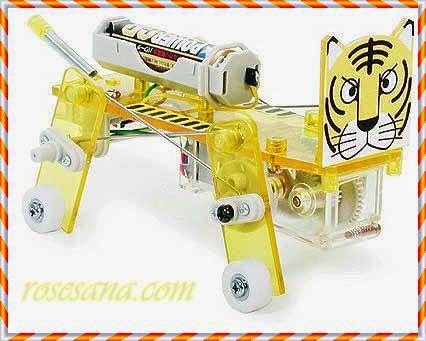 Power from the rotating motor is transferred to the legs via crank plates to make the tiger walk. 2 possible gear ratios coupled with 4 different strides let you choose 8 different speeds. A reverse switch also allows backward movement. A see-through switch with yellow transparent parts adds a cool, futuristic look. Moreover, this feature also allows you to see internal mechanisms. Tiger's body parts have been molded with yellow semi-transparent plastic. Stickers to reproduce tiger's stripes and a humorous cartoon face are included.